Join us for a Q&A session and discussion with internationally renowned fashion designer Evan Biddell and stylist Ellen Balsevich regarding the 81lb Challenge collection and display. Kelsey Dundon, editor of The Anthology - a widely read fashion blog - will moderate the discussion. The average North American discards 81lbs of textiles per year, contributing to the irresponsible cycle of waste. This ranks Fashion as the second-most-polluting industry next only to Oil! Illustrating the weight of textile waste in North America, the 81lb Challenge urges the industry and consumers to rethink and reuse textiles, rather than discard and buy new. Designer Evan Biddell has accepted the challenge of creating a collection by transforming second-hand clothing from Value Village thrift stores into repurposed gorgeous garments. Winner of Project Runway Canada - Season 1, Biddell’s ability to transform and rethink textiles inspired the stunning collection “VV by EB - Value Village by Evan Biddell” which graced the runway in Toronto earlier this month. 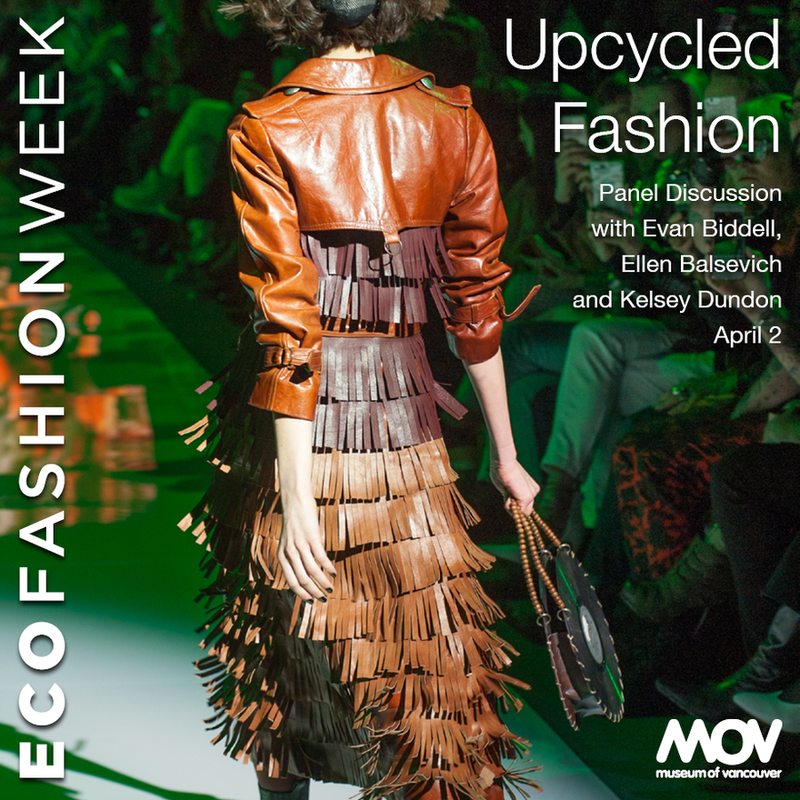 Both Biddell and Balsevich will respond to the challenges and excitement of repurposing garments and their eco-friendly approach to reducing garment waste. Tickets: * Adults: $10; Seniors, Students: $10; MOV Members: Free! Evan Biddell launched his career as the first winner of Project Runway Canada in 2008. This self-taught, eco-minded fashion outlaw has shown eight collections at Toronto Fashion Week, toured through China, and has shown work in New York City. A master showman and often outspoken designer, Biddell rarely steers away from his core values and openly voices his opinions on imprudent fashion issues. As the designer in residence of the historic Darling Mansion in Toronto’s Queen West district, Biddell strives to express his art through clothing and fresh collaborations while continuously staying relevant and authentic in a rapidly changing fashion landscape. Biddell’s ever-evolving brand reflects his growth as an artist. www.evanbiddell.com. Ellen Balsevich is a wardrobe stylist whose work invokes the relationship between fashion and art. After spending time living abroad, Balsevich pursued an internship in New York City where she worked alongside some of the world’s top designers. Upon returning to Canada she studied Integrated Media at the Ontario College of Art and Design, where she focused on new media in art and spent a brief time working in the visual arts. Ellen currently freelances and collaborates with various designers and photographers. Longtime friend and designer Evan Biddell approached Ellen to style his most recent collection with Value Village where her fine art background in repurposing plastics as jewelry, hand painted footwear and crafted masks further helped conceptualize the upcycling of the 81lbs Challenge collection.